Where does folklore end and reality begin? What is the overlap between these two planes of "existence"? This was a question obliquely asked in a recent article by “Dr. Beachcombing” when he reviewed my book “The Water Horses of Loch Ness”. You may wish to read his article first before proceeding here. The Doctor (as I will call him) holds the article in tension between two schools of thought. On the one extreme, there is my view that these old tales had a biological basis in truth. That is, An Niseag (the old Gaelic for Nessie pronounced "An Nee-Shack"), was a real creature hidden under the various layers of folkloric accretions. But in opposition, was the dismissive view of Daniel Loxton, co-author of “Abominable Science”, who viewed all folklore as irrelevant to the question of what is the Loch Ness Monster. I reviewed that book from a Nessie perspective back in September. He ultimately is sceptical of any real creature beneath the folkloric or real waves and sides with Loxton in that respect. However, he sides with this author in regards to Loch Ness folklore and opposes "Abominable Science". There was a tradition of a beast in Loch Ness which people believed to be true. Delving further though, he had issues with some of the stories I presented. He though I was indulging in "special pleading" regarding the Richard Franck story of the 1658 "Floating Island". He does not say why, but given what I know about Loch Ness, I highly doubt Franck's mass of vegetation has any mileage. I refer him and readers to my article on that subject here. There is also the issue of historian David Murray Rose's letter to The Scotsman on the 1st January 1934 which gives various known and unknown pre-1933 monster stories but (infuriatingly) without the name of the original sources. Another article by the Doctor which I covered here, partly vindicates Mr. Rose on another old story, but sadly progresses us not an inch on finding these particular old sources. Indeed, I recently found another letter from Mr. Rose to The Scotsman for 30th November 1934 when I was looking for references to crocodiles at Loch Ness. The relevant portion is below and refers to dates around 1828 and 1850 but what quite prompted David Murray Rose to mention those dates, I have no idea (though he refers to his "notes" further in the letter). Moving on, the Doctor is hesitant to accept stories from witnesses before 1933 but only made public after 1933. He feels there may be some form of Nessie "contagion" introduced into these accounts. I agree the possibility is there in theory but I do not accept that this invalidates all these accounts (though the Doctor does not do this either). Sceptical researchers can either dismiss them as fabrications or as people who genuinely saw something they could not explain years before (to which the usual boat wakes, birds and otter explanations are retro-fitted). With the introduction of the Nessie genre in the 1930s, those witnesses may well have applied the monster template onto them, but that by no means lessens the degree of mystery they attached to what they saw. Hence, they should be assessed each on its own internal evidence, in the same manner as a more modern report. But it is then asked why one should accept the Kelpie tradition as being an indicator of something physically unknown anymore than the equally prevalent tales of fairies in the Highlands? Now, I may not believe in a race of indigenous fairy folk inhabiting the North of Scotland, but does that mean one must dismiss all Highland tales as having no tangible basis in reality? If people, outside of the Highland traditions, had not continued to report strange sights in Loch Ness, perhaps we would have. Actually, this is where things dovetail into my separate paranormal studies. Since the days of Jacques Vallee's "Passport to Magonia" and John Keel's "Operation Trojan Horse", there has been a growing school of thought that many strange phenomena from centuries past up to this present day are merely different manifestations of the same underlying cause. From diminutive fairies to Adamski's blond Venusians to today's skeletal grey aliens, none of them cohere together at the surface but they are all the same stuff of folklore both ancient and modern. The underlying cause is a matter of speculation and ranges from Charles Fort's "Cosmic Joker", to the Collective Unconsciousness of mankind to another intelligence. Or one could play it safer and speculate on something that emanates from our deepest psyche. I have no fixed opinion on the matter. But as to the accretions of folklore, be it green-jacketed fairies or talking kelpies; these can be discounted as man's attempts to reconcile these shady phenomena with man's surroundings. The Doctor correctly points out that Kelpie folklore was important in providing part of the "kindling" that ignited a new level of story telling at Loch Ness, one which changed into a dinosaur (for me the same creature, but a different representation). 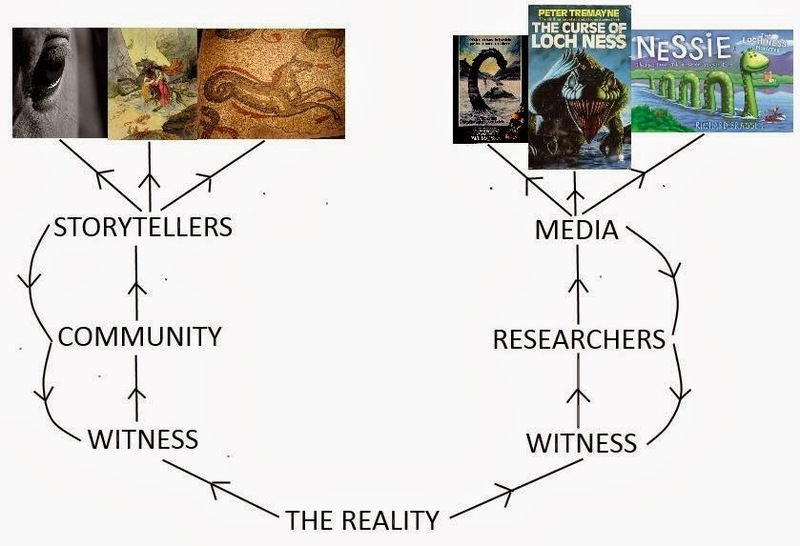 The way I see it is represented in the diagram below which was part of my Kelpie talk at last year's "Nessie at 80" Symposium. In this we see two parallel but similar worlds. There is the ancient and modern branches which have a common root called "The Reality". From this springs what witnesses claim to have seen moving in the waters of Loch Ness. Here we have the first level of perception. The next level of perception is the local group perception. Here the accounts of the witnesses are recounted, either to the local community of old or the researchers today who record the stories as faithfully as possible. The final level of perception are the storytellers or their equivalent in the modern media. They take the recorded accounts and turn them into stories compatible with the culture of the day. So, in the diagram above, that transforms to the Kelpies, Water Horses and Water Bulls of fireside raconteurs. Today, it translates to the various green and fierce monsters of films, books and artists. Finally, we have the downwards arrows feeding back from media and storytellers to community and researchers and finally to witnesses. These represent the cultural and scientific ideas of the time which shape to varying degrees how future generations will feed back up the loop. That in itself is a controversy as some say this is sufficient to form a positive feedback loop that can disengage from "The Reality" while I say there is no such thing as a free lunch in this matter and has to be sustained by whatever lies beneath the waves to propel it, else the whole cycle collapses after a short time. Moreover, I would suggest that An Niseag was the "seed" for other Water Horse tales that sprung around ancient Scotland (perhaps Mhorag also helped). One proof of this is the higher than usual concentration of Kelpie lochs around Loch Ness. However, unlike An Niseag, these derived lochs have no underlying reality and hence peter out over time. There is also a modern parallel to this when other aquatic cryptids gained prominence when Nessie appeared and a lot of modern sea beasts are often referred to as "The Loch Ness Monster of ...". That much seems certain to me, but the root cause called "The Reality" which has no resolution because it is yet to be unambiguously observed foments controversy. To the skeptics it is simply a collection of unremarkable, everyday events. To others it is a creature of more interesting proportions. One of the items from that time proved most interesting to the Doctor (as it does to me). The article in question was printed by the Inverness Courier on the 8th October 1868 and is reproduced below. “A few days ago a large fish came ashore on the banks of Loch Ness about two miles to the west of Lochend Inn. Neither the name nor the species of the strange visitor could be satisfactorily explained, and large crowds of country people went to see and examine for themselves, but left without being able to determine whether the monster was aquatic, amphibious, or terrestrial. Some of the most credulous natives averred that a huge fish, similar in size and shape, had been occasionally seen gambolling in the loch for years back, and with equal determination protested that its being cast dead on the shore boded no good to the inhabitants – that, in fact, its presence presaged dire calamities either in pestilence or famine, or perhaps both. At last, however, an individual better skilled in the science of ichthyology appeared on the scene, and ascertained that the strange visitor was nothing more or less than a bottled nosed whale about six feet long. How one of the denizens of the ocean came to be cast ashore at Loch Ness was the next question, but, this too, has been set at rest, for it was ascertained that the blubber had been taken off! This the story where folklore ends and reality begins. No longer the Kelpie of fireside ceilidhs, but a huge fish seen for years back. A great fish that coexisted with dark tales of aquatic horses was now in the process of decoupling from the legend. Let us take a closer look. The background is a strange carcass found on the shores of Loch Ness near Abriachan. Being as yet unidentified, some of the local natives presumed it to be the Kelpie of old. We know this because of the supernatural construction they put on it by predicting calamity for the community. If you are familiar with this genre of folklore, it was known that bringing harm or imprisonment to a Kelpie was a sure path to ruin. However, the correspondent seems to get his local natives mixed up as he also quotes them talking of a great fish. Anyone with the slightest knowledge of Kelpies will know they were never likened to fish. Nevertheless, the author of the report assigns the label "credulous" and "primitive" to these people. 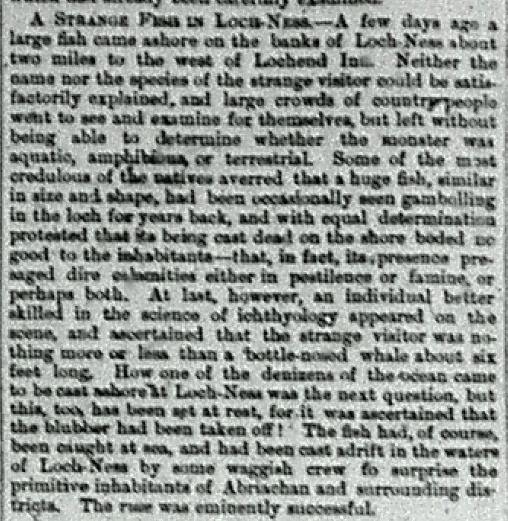 These derogatives very much explain the attitude of the Inverness Courier to any talk about strange creatures in Loch Ness and why we rarely heard anything about them. Quite simply, such tales were regarded as nonsense and superstition by the editors of the newspaper. With the Industrial Revolution transforming Scotland and Victorian academics assuring everyone that such tales were mythology, Highland newspapers were jumping on the progressive bandwagon. So, any story you are likely to meet on this subject is going to be framed in a sarcastic way that not only entertains but very much advertises the modern, dismissive stance of the newspaper. This is corroborated in at least two other Loch Ness newspaper accounts of the time which leave the reader in no doubt about how the newspaper treats such a subject. The other interesting point is why the Inverness Courier does not simply dismiss the tale of a great fish as yet another sturgeon story? A casual search of digital archives reveals various stories of sturgeons being caught around the Moray Firth and the River Ness. Why not state this as such a case? After all, the carcass was stated as being six foot long, which is a typical sturgeon size (though it is unclear how the locals decided their fish was six foot long - unless they were saying that six foot was visible at the surface). I would suggest the way the "great fish" story was related by locals to the journalist precluded such an explanation. And, finally, the reporter says the carcass was dumped "by some waggish crew to surprise the primitive inhabitants of Abriachan and the surrounding districts". Why did they do this? The phrase "primitive inhabitants" is linked to the previous phrase "credulous natives" and their great fish. I would suggest the crew were aware of the local tales of this beast and decided to pull off a hoax. But you may say "A monster hoax at Loch Ness in Victorian times?" and I say "Yes". There was a sufficiently strong and contemporary belief in a large creature in Loch Ness to put the "progressive" newspapers in sarcastic mode and those itinerant fishermen into hoaxing mode. Or to put it another way, if there is a monster hoax, it presupposes a monster belief. Did nothing more than waves, logs and birds cause the modern and ancient legends of the Loch Ness Monster? Are even modern stories just a continuation of the folkloric traditions which themselves will be discussed and pored over centuries from now? Or does it take more than the mundane to kick start these strongly held beliefs? Regular readers will know this blog's answer to that question. "A strange and wonderful Relation concerning a Mermaid that was seen and spoke with on the Cliff of Cromarry, near Inverness in Scotland, by a young gentleman, a Merchant, named Lauchland Mackintosh, who was tossed on the main Ocean for four Days and Nights. Together with an account of his wonderful Dream, and the strange Conversation he had with the Mermaid, and how he was preserved after his Return to Inverness." Now I had been aware of this story whilst researching my book on Scottish Water Horses a couple of years back, but ignored it along with the various sea serpent stories as I was more interested in land locked waters and rivers. “The Morag dwells in Loch Morar. She gives her name to the lake and still appears when any of the old Macdonalds of Morar die. Like the other water deities she is half human half fish. The lower portions of her body is in the form of a grilse and the upper in the form of a small woman of highly developed breasts with long flowing yellow hair falling down her snow white back and breast. She is represented as being fair, beautiful and very timid and never seen save when one of the Morar family dies or when the clan falls in battle." "The hill side which sloped down to the lake had the name of being haunted, and the waters of the lake itself had their ghostly inhabitant in the shape of what the Highlanders called the water-bull. There was also a story of some strange mermaid-like monster being sometimes seen, having the appearance of a monstrous fish with long hair." I do not recall coming across any other such stories of loch mermaids, so they are in even shorter supply compared to their companions, the Kelpie, Water Horse and Water Bull. The old Victorian sceptics mused that the long strands of kelp that dotted the Scottish coastline may have reminded natives of the Kelpie mane and I don't doubt some would have speculated likewise concerning the long hair of the mermaid. The trouble was that Kelpies were freshwater creatures, but why let the facts get in the way of a good theory? I have already covered Jonathan's picture taken in 2012 in a previous post. But Jonathan now brings his own story and thoughts to the table in this blog posting. He has also put up an accompanying YouTube video (below). Jonathan delves into the paranormal aspects of Nessie theorising, of which I am sure there are plenty of advocates. I used to believe in this theory (since I believe in paranormal phenomena in general), but have since decided to pursue the biological side of things. Of course, we hear of strange things going on around Loch Ness which are suggestive of such things. We read of the strange events that Tim Dinsdale recorded which were not Nessie related (I would love to see that journal). Also, Ted Holiday's strange goings on surrounding the 1973 exorcism of Loch Ness also raises the eyebrow. 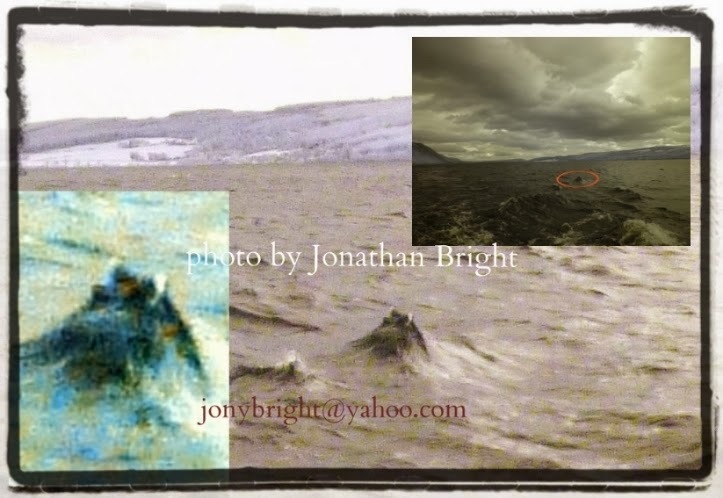 Though Jonathan brings in the magician, Aleister Crowley, it is a fact that monster reports and legends preceded his arrival at Loch Ness in Edwardian times by a long stretch. But paranormalists may argue that what ever "portal" attracted Crowley there, was the same progenitor of Nessie. Indeed, it is a bit unclear why Crowley selected Boleskine House at Loch Ness. The house configuration he demanded could have been fulfilled in any number of areas, but why this particular area? Interesting questions, but again, just at the edge of reality's peripheral vision. The hunt continues, I hope to be at Loch Ness in about a month's time!